Bob Anslow at International Yacht Collection brings news of a $1 million price drop on the 35.6m motor yacht Star Sapphire. Built to RINA class by Bilgin in 2007, Star Sapphire features floors in intricate thin-cut Italian granite, ornate glasswork and custom carpets. Accommodation is for eight guests in a main deck master suite, VIP stateroom and two guest cabins while twin 2000hp MTU engines give her a cruising speed of 15 knots. 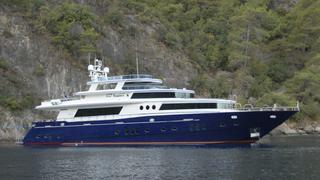 On display at the Fort Lauderdale show, Star Sapphire is now asking $5,445,000.